Sorry to get to this so late. George Martin, the Fifth Beatle and the group’s producer of all their amazing records, turned 90 today. Since it’s 1am in London he is no doubt asleep. But we owe Sir George a huge debt of gratitude for making those records, producing and arranging them, suggesting things to Lennon and McCartney and helping them realize their ambitions. I think his last real act was apprenticing his son Giles, who helped him create the soundtrack for the Cirque du Soleil “Love” show. That was an incredible project in which Sir George pulled apart the whole Beatles catalog and re-assembled it like a cubist painting. Turns out the Bond producers– Cubby Broccoli and Harry Saltzmann– wanted George to score the film. 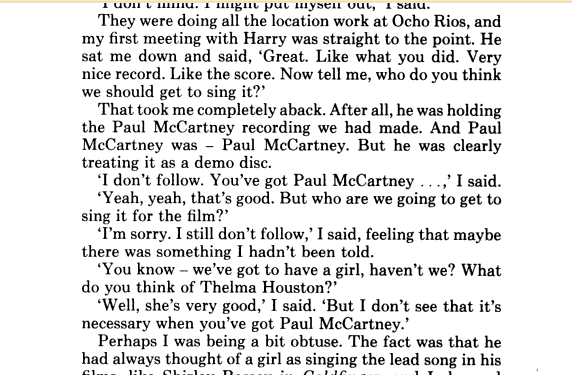 They liked Paul’s “Live and Let Die” track. But they wanted a female singer, like Thelma Houston! George writes, they considered Paul’s version a demo track! Cooler minds prevailed, and the rest is history. Sir George is retired now. But boy oh boy– what an immense talent. There would never been Revolver, Sgt. Pepper, The White Album, Let it Be, Abbey Road, any “later day” Beatles without him. Happy Birthday, Sir George Martin.